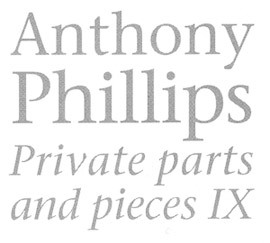 Though already announced in spring the year before it took the ninth part of Anthony Phillips‘ Private Parts & Pieces series until November 04  to be released. There is not much point in comparing Dragonfly Dreams to its 1992 predecessor because New England consisted mainly of material that was written for the album. Here we have a collection that spans the years from 1980 to 1995, with a style and concept that faintly resembles Slow Waves, Soft Stars and A Catch At The Tables. Five pieces were written and recorded with Enrique “Quique” Berro Garcia who has also graced volumes III and VII of the series. Why this album was divided into two parts is anyone’s guess. The second part consists of the pieces with Quique; another explanation suggests that dividing an album into halves need not have technical reasons (as on LPs) but also influences the reception. The Dragonfly Dreams begin with three unobtrusive guitar pieces: Something Blue resembles a lied; Ant wrote this piece with Richard Scott in the Invisible Men sessions. Quango features some rare jazz harmonies on the guitar. Ant mentions in the liner notes that it is difficult to play; perhaps that is the reason why this (too short!) intermezzo is published only now though it was written in 1980. Lostwithiel brings a change to synthesizer music. Incidentally, the Phillips/Rutherford composition The Geese And The Ghost has similar working title. A basis sequence with few overtones borrows from Minimal Music. Several musical figures move on top of it until all rhythmic elements suddenly vanish to make the transition to Under The Ice, an improvisation that resembles Ice Flight – Ant definitely goes for the New Age label here. Sarah Blakeley's Evening, mixed from “four independent Stratocaster parts”, is sort of a link to She'll Be Waiting, the only song the raw version of which was already published on The Meadows Of Englewood. The sound (courtesy of Terry Medhurst) lacks a bit of the magic earlier Private songs have. Still Time leads us into Part II which begins with four pieces Ant recorded with Quique: Gentle guitar chords in a healthy mixture of consonances and dissonances in Hills Of Languedoc generate an exotic atmosphere; Luigi Palta's Confession provides a merry contrast and is followed by The Tears Of Pablo Paraguas that sounds as if it has been played at quite a distance from the microphone. No explanation is given for the names in the song titles. Melancholy Flower brings this QBG section to a pleasant end. The Night Song is “sung” by a female “aah”; Ant improvises on a simple tonal rhythm. The sample sounds real, but the transition from one note to another shows the difference from real vocals. Chinese Walls is a song Ant recorded in 1986 on, as he describes it, a “bizarrely tuned twelve-string guitar”. It is full of interesting elements and ideas that make the 18 minutes very entertaining – just note the delightful flageoletts. Old Faithful is an excerpt from a longer improvisation with Ant on the keyboards and Quique on guitar. Summer Ponds & Dragonflies is, of course, the eponym for the album. Ant describes it as a “gentle, watery piece”. Lost And Found is a “homecoming variation” (Ant's coinage for a reprise) of Lostwithiel with drum computer and sequenced sine tones. The cover artwork is not really noteworthy. It shows a slightly hoky idyll with dragonflies, moonshine and ground fog; the back shows a megalith, a firegate and an enigmatic circular symbol. With this, the hint at New Age and his thanks to “the druids of Avebury” in the Meadows Of Englewood booklet one is given to wonder whether Anthony has gone esoteric... His music, however, has remained the same.